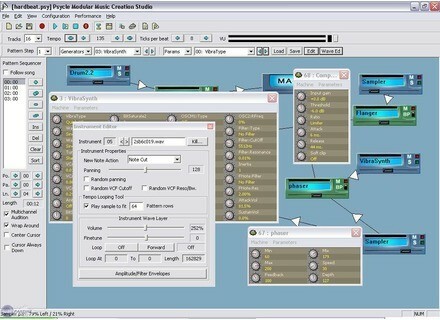 Psycle [Freeware], Sound Tracker from Psycledelics. Psycle has been updated to version 1.8.8 Beta 2. The first beta, released in August, 2010, added x64 support. Beta 2 contains mostly a couple of bug fixes in the main program and updates in most of the effect plug-ins and some native instruments. legasynth sounds much better now and fluidsynth has been updated to version 1.1.2. Also, sound skip in Vista and 7 should be reduced, thanks to using the new thread priorities defined in these new systems. Integrated support for JBridge VST bit bridge (use 32bit VSTs in x64 and 64bit in x32). Needs to be activated in the Directories tab of settings (Native Psycle bit bridging should come for release). Migrated to Visual Studio 2008 (and its runtimes) and boost 1.41. Better Vista/7 support (placement of files). Multiple fixes in the native plugins (better support of other sampling rates than 44Khz). Better UIs in some of them (Not all native plugins revised yet). Sensomusic Updates Usine 5 Sensomusic has updated Usine to v5.25f.